Very versatile sticky paste that builds and models every hairstyle. 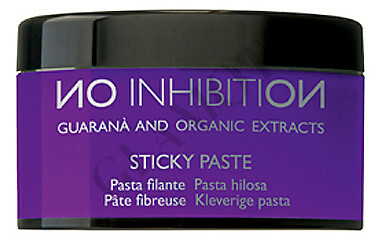 No inhibition sticky paste with guarana & organic extracts. High quality ingredients create a film around the hair and give it a stronger hold, making it conditioned and elastic. Emollient and hydrating agents reduce the electrostatic effect on the hair. Take a small quantity of product, massage it in your hands and apply on wet or dry hair, then model.ery versatile sticky paste that builds and models every hairstyle.